Before purchasing crib and nursery furniture for your daycare facility or preschool, take some time to read the following important information. In an effort to improve the safety of cribs sold in the U.S., the Consumer Product Safety Commission (CPSC) updated its safety standards in 2011. All cribs sold in the U.S. are required to pass strict tests measuring the durability of slats, mattress supports and hardware. Additionally, the new regulations require that traditional, drop side cribs no longer be sold. 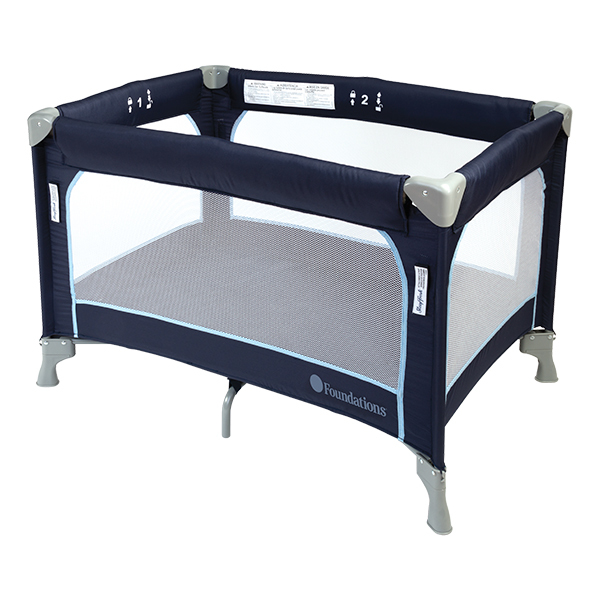 Rest assured that any crib you purchase from School Outfitters is 100 percent compliant with the 2011 federal regulations (16 CFR 1219, 1220 and 1500). While cribs provide an excellent place for young children to safely and comfortably nap, they do pose some safety risks. When shopping for a crib, pay careful attention to the mattress, design and construction. Read more to find out which safety concerns require your consideration. Mattress – When selecting a crib mattress, make sure that it properly fits your crib. The mattress should fit closely against the sides, without leaving enough room for a child's limbs or body to become trapped. Choose a firm mattress that will support the child, keeping the child on her back. Soft mattresses may play a role in Sudden Infant Death Syndrome. Additional considerations include the material of the mattress and the fit of the bedding. Consider using an organic crib mattress to reduce the risk of toxicity in the child's sleeping environment. Sheets should fit the mattress tightly to avoid asphyxiation and rebreathing risks. Avoid loose toys and stuffed animals in cribs. Posts, Rails & Slats – Consider the dimensions of your crib, the space between horizontals and the risk created by posts when purchasing a crib. Posts – Ornamental posts that extend more than a 1/16 of an inch from the top of a crib can pose a hazard, as they may snag clothing and cause strangulation. Avoid cribs with extended posts. Rails – If rails adjust, they must extend nine inches above the mattress while in the down position. They must extend 26 inches above the mattress when in the up position. There should be no horizontal bar within 20 inches of the mattress when in the up position. Slats – Slats, spindles, corner-posts and rods cannot be more than 2 3/8 inches apart at any point. Hardware & Construction – Hardware accessible to a child must be designed and constructed so that it does not pinch, bruise, crush, lacerate, break or amputate any part of a child's body during normal use of the crib. Also, wood surfaces must be smooth and free from splinters, cracks, or any other potentially hazardous building defect. 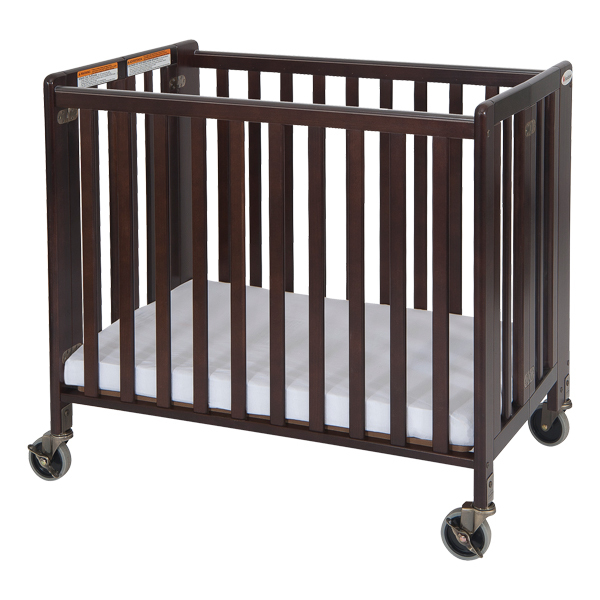 Traditional Crib – Traditional cribs sold on this site feature stationary sides. Stationary sides present a safer alternative to drop sides, which provide less security and structure. 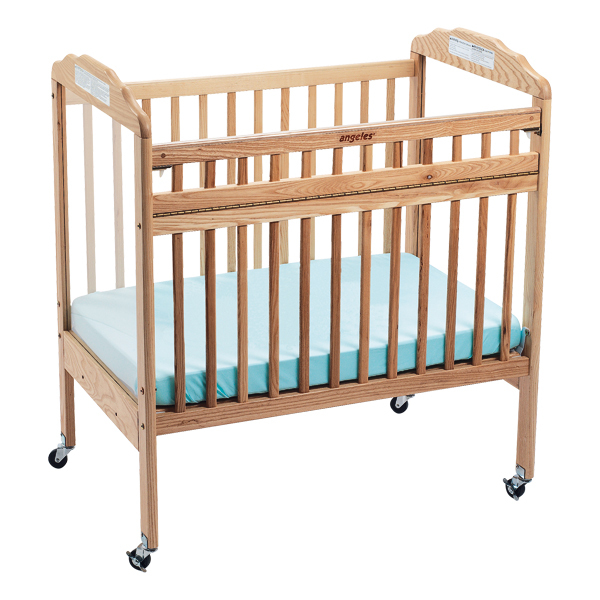 Many traditional cribs feature casters, slat slides and various options for ends. Some have adjustable platforms for the mattress that you can change depending on the height of your child. Accessories – Accessories include mattresses, fitted sheets, step-stools, storage drawers, cushions, seats, evacuation casters and gliders. Carefully compare sizes to make sure that your accessories will fit with your crib. Folding Crib – Folding cribs provide a durable, yet portable solution for your crib and nursery needs. Use them in an early learning or daycare facility and easily pack them up when not in use or for transportation. Clear End – These cribs encourage visibility. Caretakers can easily check on a child within the crib, and the child can easily look out. Most clear ends feature acrylic plastic construction, so they resist breaking and scratches. Mirror End – Mirrored ends provide entertainment for children when they spend time in cribs awake. They also encourage the development of cognitive and coordination skills. Mirror ends can reduce visibility. Use a clear or slat end on the opposite side. Slat End – This traditional end offers a degree of visibility while maintaining structural rigidity. The majority of cribs feature slat ends. Many slats feature a non-toxic finish for teething babies. Solid Hardwood – Solid hardwood ends limit visibility while providing structural integrity. If concerned about visibility, consider an option for one solid end and one clear end. Casters allow improved mobility and flexibility, so you can use your crib in any room of your school or daycare facility. Evacuation casters allow you to easily transport children outside in the event of an emergency. Standard Casters – Standard casters allow caretakers to safely move sleeping children to different areas, reducing the risk of falls or disturbing the child. They can, however, pose significant risk. Do NOT use cribs with casters around older children who might push them over stairs or into walls. Only purchase cribs with casters that also feature locks, and use those locks to keep cribs securely in place. Fire Evacuation Casters – Fire evacuation casters have larger wheels than standard casters, allowing them to easily maneuver over rough terrain and to roll outdoors. Fire evacuation casters feature locks to keep them securely in place. Click here for more information about our selection of cribs and nursery furniture or to place an order online. If you would rather order over the phone, call our knowledgeable sales team at 1-800-260-2776.